A RUP LIFE: Tom and Jerry In The Dog House DVD available 3/6! 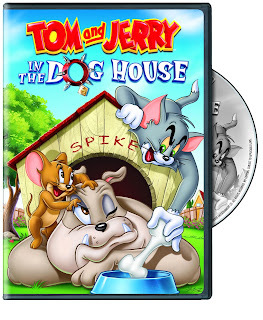 Tom and Jerry In The Dog House DVD available 3/6! Who doesn't love Tom & Jerry? I remember watching it as a kid so when we received Tom & Jerry In The Dog House, I knew my kids would enjoy it too. So we all gathered around the tv last night and watched. There was lots of laughter. This dvd is all about the dogs. I think those might be some of the funniest because Tom gets beat up almost every time. Austin my oldest (11 yrs) laughed hysterically through the whole DVD. Included is the award winning short Quiet Please! in which Spike warns Tom not to make a sound while he naps. Other classic shorts included are Tom’s Photo Finish, in which Tom frames the family dog in order to avoid getting into trouble. In another featured classic, Cat Napping, Tom tries to fish at a private lake guarded by Spike. Also featured is Solid Serenade, in which Tom tries to serenade Toodles, a beautiful lady feline but not before he finds an ingenious way to get past Spike the dog. These and several other rollicking favorites are featured in this set. You can purchase your copy where every DVDs are sold or on Amazon.com. Thank you to Warner Bros Home Entertainment Group for sending a copy for review. As always all opinions expressed are my own.